(11:40 a.m. GMT) -- Fred. Olsen Cruise Lines has revealed details of its 2018/2019 programme -- with its fleet of four ships scheduled to travel to 228 destinations in 73 countries, including nine maiden ports of calls -- and a shift in focus from no-fly to fly cruises. The 2018/2019 season will feature five U.K. departure ports -- including Southampton, Dover, Liverpool, Newcastle and Edinburgh (Rosyth) -- a slight reduction from the line's seven U.K. departures this year. Edinburgh (Rosyth) is a first for the line, with the 1,350-passenger Balmoral offering nine itineraries from the Scottish port from 2018. At an event held in central London last night, the line's director of product and customer services, Clare Ward, said: "U.K. departure ports have been reduced down so we can concentrate on improving the guest experience in the remaining ports, while only slightly reducing the number of passengers within a 90-minute drive time of the port. That, coupled with an increase in fly-cruise departures, allows the strengthening of the variety of cruises that have a duration of two weeks and under." New fly-cruise itineraries for 2018/2019 include Arabia and India, which complement the line's popular existing Indian Ocean itineraries; while maiden calls for the season include: Anavilhanas, Brazil; Chioggia, Italy; Georgetown, Ascension; Khasab, Oman; Kirkenes, Norway; Mazatlan, Mexico; Newcastle, Australia; Porbandar, India and Sanremo, Italy. Fred. 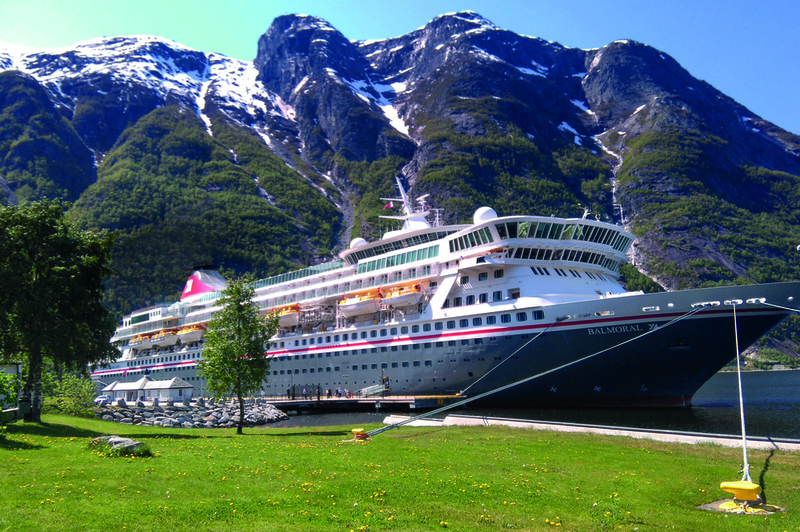 Olsen is strengthening its scenic cruise offering, with more river and fjord itineraries to destinations such as Norway, and more mini-cruises of five nights and under to the Norwegian Fjords and the Seine. The line also revealed its focus on "experience-led" cruises to major global events, such as the Edinburgh Tattoo, Northern Lights and New Year's Eve in Sydney. Boudicca will sail on a 16-night Film Stars & Classic Cars itinerary in Mary 2016, coinciding with the Cannes Film Festival, and Braemar will sail into the heart of Seville on a 14-night Authentic Andalusia & Seville Orange Blossom itinerary in March 2018 -- coinciding with the period when the orange blossom is at its most fragrant. New itineraries for the line include Balmoral's California, Mexico and Panama Canal voyage -- departing from Southampton on a 62-night itinerary in January 2019 -- and Boudicca's 14-night Authentic India fly cruise in October 2018, which departs Dubai with calls at Kochi, Porbandar, Mumbai, Goa, Vizhinjam (Thirupananthapuram) and Colombo. The line will also operate its popular mystery cruises again, with only the captain in-the-know as to the ships' itineraries. Fred. Olsen has revealed that Boudicca will sail a five-night mystery cruise in March 2018, Black Watch will sail a nine-night mystery cruise in October 2018 and Balmoral will sail on 12-night mystery cruise in November 2018. Fred. Olsen's sales and marketing director, Justin Stanton, said: "A Fred. Olsen cruise is all about getting ‘closer’. From taking advantage of the ship’s smaller scale, to calling into destinations out of reach to larger ships, all the way through to the special, one-off itineraries and excursions that show destinations in real depth -- it is part of the Fred. Olsen ethos, every step of the way. "We are proud to have been named ‘Best for Itineraries’ by Cruise Critic’s independent experts two years in a row, and we are renowned for giving our guests a very different kind of holiday, tailoring our cruise programme to celebrate great events and festivals around the world, on over 135 different itineraries, with a variety of durations, in all the style and comfort of our more ‘human-sized’ ships." By the start of the 2018 season, all of Fred. Olsen's ships will have undergone a makeover, with nearly £10 million spent on Black Watch's refurbishment in December 2016. While Balmoral and Braemar will undergo a refit in December 2017 and Boudicca in March 2018.